Kinetrex Energy, a U.S. LNG supply company based in Indianapolis, Indiana, is the recipient of a 2019 “Driver of Change” award for its innovative mobile Liquefied Natural Gas (LNG) fueling system. Greater Indiana Clean Cities Coalition recognizes fleets as part of its annual Clean Fleet Awards, and in this instance acknowledged Kinetrex for its fueling system which is designed to easily transport and fuel fleets with environmentally-friendly LNG. A mobile fueler provides a short or long-term LNG fueling solution for fleets and enables trucks to fuel onsite without a permanent station nor be reliant upon retail fuel costs. A company can try LNG within their own operation without an initial capital investment in infrastructure. Kinetrex offers a full-service, in-house team of financing, operations, and customer service to get fleet operators over the initial hurdles associated with switching fuels. Mobile LNG fuel systems are available for short or long-term lease. Companies realize the cost savings of wholesale LNG compared to diesel or any other fuel from day one. LNG has been the safest fuel on the market for many years and LNG produces much lower carbon emissions when compared to diesel. 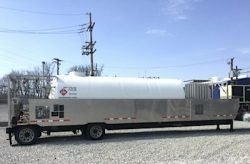 A company looking to expand their LNG fleet can also utilize a mobile fueler to compliment their existing fueling infrastructure. Mobile fuelers also be used on the edges of a transportation network to support a growing or evolving fleet.